On Tuesday I watched Ed Miliband deliver his maiden speech as the new Labour Party leader at the party’s annual conference. Elected with the wafer thin margin of 1.3% of the votes cast, pipping David his brother to the post, for most of the contest the clear favourite of the five candidates to seize the prize, Ed spoke confidently, relaxedly and coherently. For the first time for more than a decade Labour rank and file heard a leader who said what he means and spoke about concerns close to their hearts. While reciting some of the major achievements of the thirteen years of the Blair/Brown duopoly, he made it clear that he recognised that there had been major policy mistakes. Significantly, he apologised for the Iraq war. That one act along will commend his leadership to hundreds of thousands of people who deserted Labour as a result of the illconceived and illegal invasion of Iraq. That and his clear recognition that the Blair/Brown leadership lost its way, particularly in failing to recognise the socially corrosive effect of the widening wealth gap. That Ed Miliband does not condone heaping the multi-billion pound cost of the debauched banking debacle on to ordinary working people who carry not the faintest slither of responsibility for the burden heaped on the national debt, will awaken a faith in the Labour party to represent the interests of ordinary people. That together with his clear recognition of the importance of local government must give us all hope that we shall be seeing principled and persistent opposition to Tory-Lib Dem cuts, which are ideologically driven and totally divorced from economic reality. This all goes to underline the problem facing the City Council’s coalition. I said at the time that the Labour Group, with 27 of the 60 seats in the Council chamber should have had the courage to form an administration on their own rather than carry on with the pre-May election support of the Tory, Lib-Dem and City Independents groups. It would have been virtually inconceivable for Labour to have lost a vote in Full Council. As it is, they now face the October decimation of local government spending by the Tory/Lib Dem Coalition government with the enemy within their administration! It’s not too late. Labour should seize their chance, jettison the ToryDem cutters and City Independent ditherers and come out with a coherent, cogent case for protecting vital public services for the city. Ed Miliband, Labour’s New Leader “â€œ Is He Red, Radical Or Revolutionary? The weekend saw a tense almost X-Factor type results show, Election for the new Labour Party saviour. As the results were read and candidates were eliminated, their votes re-distributed among those still standing until the new leader was announced. That Leader proved to be Ed Miliband, described by some as an also ran, hailed by others of being Labour’s best new broom willing to sweep all before him clean. His winning margin just 1.3%, the union members vote giving him the edge over his brother David. I was an interested observer of the whole contest. That contest was fought with great humility and dignity. There were no personal attacks, but what there was evidence of was a broad church of opinion on the future of the Labour movement. Among other policies, his appeal shot through the roof when he announced that he thought that the Iraq war was a mistake. Greater bank levies and taxation, a national “ËœLiving Wage’ and a pledge to win back the “Ëœmiddle ground, rubber stamped him as a serious contender. The vote of the union members, individual mind not block votes, proved to be the difference between him and his brother David the pre-contest favourite. The media seem to want to turn Ed Miliband’s victory into a major move to the left wing. I can’t take that seriously to be honest. Red Ed they call him, but do we really seriously accept that Ed Miliband is of the left? He says he is from the middle ground and I can totally see that. New Labour moved to the right of the centre ground of the political spectrum. Will it really be an issue if Ed Miliband moves the party back to the centre left? He is hardly a Michael Foot is he? He is on record as saying that he wants to attract the 5million voters to Labour as a result ofTony Blair’s New Labour experiment. New Labour was different, some saw it as a new start for the party. Others saw it as an abandonment of the working class voters. The problem was that everyone saw New Labour as well…new, something radical and different to the past. That radical difference however, would eventually be seen as ‘the establishment’. I think it would be harsh to say that this had an impact on the rise of the politics of the far right. But in my opinion there is no doubt that the British National Party seized the opportunity of marketing themselves as the party of the working classes and the darling of the benefit claimers. If Labour are to stand a chance of winning the next election in 5 years time they need to show that under Ed Miliband they will be different. He will need to show responsibility in opposing the upcoming cuts and where he does oppose he must table a credible alternative. The normal Joe’s and Josie’s in our country want to see an effective opposition that does exactly what it says on the tin and opposes those cuts that impact severely on the most vulnerable and needy in our society. Tomorrow’s leader’s speech at the Labour Party Conference will give us more of a clue. It will be difficult for Ed Miliband, despite some of the hostile media questioning, to set out his vision for opposition until we hear the ConDem’s Comprehensive Spending Review on October 20th. 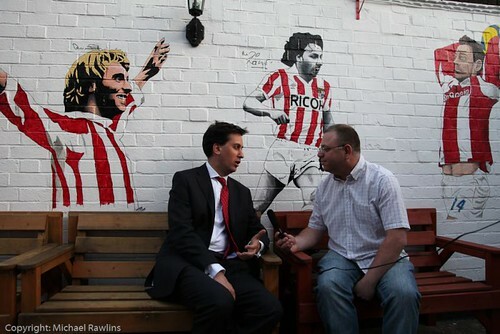 So what does Ed Miliband’s victory mean for the City of Stoke-on-Trent? Well he knows how to use the Sat Nav to get to the City. He has visited Stoke-on-Trent twice in the past 6 months. No other leadership contender or former minister has visited our city that I can think of in recent times. The Labour Party parted company with some members in the run up to both the local and general elections. They set their stall out to encourage a new more dynamic breed of candidate and this clearly paid off. Sources from within the City Labour Party have confirmed that there will be more of the same for next year’s all out council elections. New members and members who have never considered standing before are putting themselves forward. From what my sources tell me, the local Labour Party are excited by Ed Miliband’s victory. His message that he has been listening to the opinions of members of the public and their reasons for not voting, or turning their backs on Labour, is something that party members locally can go out and campaign on. The local Labour Party right up to the Party Leader Ed himself need to send out a very clear, progressive vision on life under the Labour Party for electorate of Stoke-on-Trent as the country as a whole. Stoke-on-Trent’s three local Members of Parliament all favoured different Labour Leadership Contenders. Tristram Hunt voted for David Miliband, Rob Flello voted Andy Burnham and Joan Walley voted for the winner Ed Miliband. This morning I managed to reaction to Ed Milibands victory from first Joan Walley MP for Stoke-on-Trent North who voted for him and was responsible for bringing him before party members in the City for a question and answer session. I also managed to catch up with Rob Flello MP for Stoke-on-Trent South who had voted for Andy Burnham but is happy to unite behind the new leader. He also confirms his intentions to stand for election to the Shadow Cabinet. With Gordon Brown taking a well earned rest from the stresses of the highest public office in the country, the Labour Party have begun their search for a new progressive leader. The candidates have started to emerge. The first to declare was David Miliband. He has already received the backing of former Home Secretary Alan Johnson and former Europe Minister Caroline Flint. 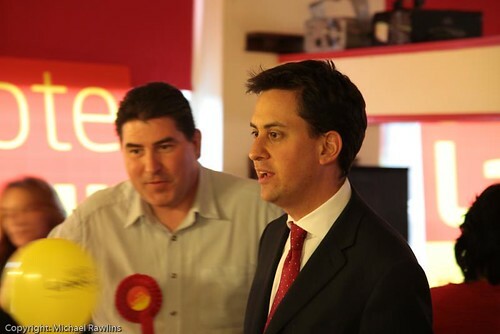 David Miliband’s younger brother Ed is also set to throw his hat into the ring shortly. Ed Miliband is the former Energy and Climate Change Minister and a past advisor and close ally of Gordon Brown. Former Schools Minister and darling of the unions Ed Balls is set to wait until probably next week before he announces his candidature. Balls is a serious front runner in this contest but has a reputation for being divisive. He was blamed for the recent breakdown in the negotiations between the Labour Party and the Liberal Democrats. A name that is also being linked with the leadership contest is that of former Health Secretary Andy Burnham. He was the only member of the former cabinet that was openly critical of the talks between the Lib Dems and his own party. He is set to wait until later into the campaign before confirming his intentions to stand for the leadership. The left wing of the party will be represented by John Cruddas in the contest. He is a powerful and influential backbencher and is said to have the respect of those who sit on the left of the party. It is thought that he is the man to return the party to it’s true socialist principles. Who ever the eventual winner turns out to be they will have a massive job to unite the party national in the wake of the imposition of parliamentary candidates across the country in the run up to the General Election. Many commentators said that the imposition of candidates was all about any subsequent post election leadership battle. The Labour Party need to rebuild nationally. They have to attract new members and ex members back to the fold. Sources tell me that the Labour Party membership is down by 2/3rds across the City of Stoke-on-Trent. This City was an example of some of the worse behaviour in the selection of candidates for both the local and parliamentary elections. As a result some people left the party to stand against official Labour candidates in a bid to make their point that the Labour Party had changed and in their opinion, not for the better. The Labour Party was victorious though, in both the parliamentary and local elections. So it could be argued that the party hierarchy knew better and were completely vindicated. They won and those that lost, lost their deposits. But the sort of selection practices displayed in the recent elections are not sustainable and have to change. If they do not there may well be a shortage of candidates in the future. Now there will be no general election for the next 5 years the mainstream parties will face stiffer opposition from fringe parties and Independents and will not be able to cash in on those who turn out to vote for a particular party at a General Election. The official announcement of the Con/Dem coalition has resulted in a record number of applications to join the Labour Party. At times during Tuesday evening when the shenanigans of the new coalition were playing out to the whole nation live on the TV news channels, the Labour Party server crashed under the weight of the amount of people wishing to join. I saw many screenshots published on the social network Twitter that bares witness to this. Many Liberal Democrat supporters were voicing their dissent at their party’s actions which was driving them towards the Labour Party. The Labour Party have an enormous opportunity in this country. They can build on their popularity by scrutinising the every move of the unlikely coalition between the Conservatives and the Liberal Democrats. It could be Labour’s re-birth. If they select the right leader, more importantly, if they select the right leader in the right way. An open, clean and transparent leadership election is essential. Mind you the Labour Party could always cash in on the ‘new dawn of politics’ and elect two leaders and follow the example of Dave and Nick. What about a Balls and a Miliband? After all don’t they always say two ‘Ed’s’ are better than one? Boom boom – thank you, I’m ‘ere all week! 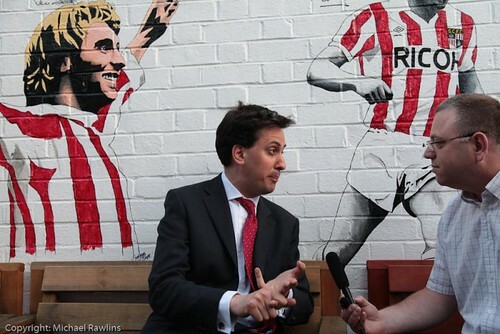 On Tuesday Ed Miliband visited Stoke-on-Trent, we caught up with him for a quick video interview about the General Election and the campaigns in Stoke Central & South and his views on a wide range of election issues. Such as the need for traditional labour supporters to come out on May 6th and vote Labour. When asked if Labours campaign had been lacklustre Mr Miliband replied that he thought that the campaign had simply been different to previous campaigns with the TV debates dominating the limelight. He also stated that as election day approaches, voters were realising that substance was more important than the style of David Cameron and Nick Clegg. In the second part of the interview Mr Miliband went to to say that he believes "Fundamentally people don’t want to vote for the BNP, they want to know that we are talking about the issues in their lives". On the conservatives he said that "People dont have enough sense of what the Tory threat is to the country and it’s our job to start getting the message out." When quizzed about cuts Mr Milliband said that cuts would begin next year and tax raises for the top earners and a raise in National Insurance contribution would be the only way to protect frontline services such as health and education. He was confident that issues such as Cutting the defeciet, keeping tax credits, Education would be important issues for people in stoke and that it was labour job to convey that message so that the country doesnt end up with a Conservative Prime Minister, which would "Terrible for Stoke". When pressed on the BNP threat to the Labour vote in Stoke Mr Miliband states that he was veremently apposed to the BNP’s ideology and that their gameplan was to exploit people’s fears. "when we speak to people and explain about the points based system, they understand and accept that if you have skills and can contibute then you can come here." He also pointed out that there are 1 million people from E.U countries in Britain and about 1 million Britons working in the E.U, and that changing the rules on E.U workers could have dire consequences for British E.U based workers. The Labour Party sent one of their ‘big guns’ to Stoke-on-Trent tonight [Tuesday] in the guise of the Secretary for Energy & Climate Change Ed Miliband. Mr Miliband paid his visit at the request of the Labour Party PPC for Stoke-on-Trent Central Tristram Hunt who had promised to use his contacts to raise the profile of the City. Mr Miliband used the opportunity to issue a rallying call to party activists and supporters. He told them that the elction was a straight choice between the Labour Party headed by Gordon Brown and the Conservative Party led by David Cameron.